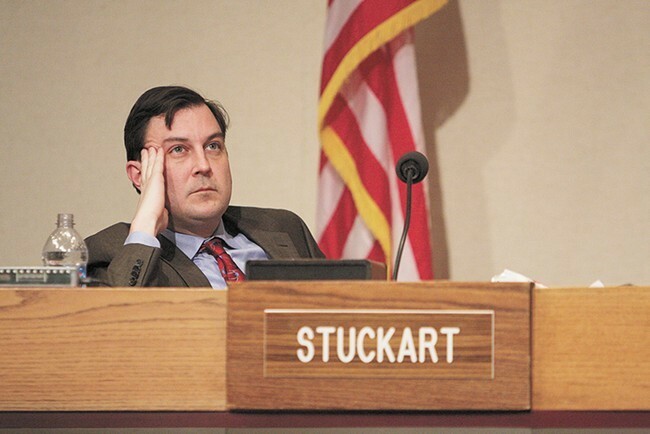 If Ben Stuckart becomes mayor, that means we'll be able to keep using this Irritated Ben Stuckart picture well into 2023! And by books, I mean the PDC filings. City Council President Ben Stuckart is running for mayor three years from now. And by three years, I mean he's essentially starting now. You wrote a draft of the press release announcing his resignation the day before. So why did City Spokesman Brian Coddington, according to the Spokesman-Review last year, tell the newspaper that he "hadn't heard" the chief was in danger of losing his job? You Want Me On That Wall! You Need Me On That Wall! The Spokane Wall digs deep into the Geocities inside its heart to put out a website announcing cool upcoming events. Who watches the watchmen the other watchmen bring in to watch the watchmen? The police ombudsman oversees conduct from the Spokane Police Department. But in the case of the Ryan Holyk accident, the police were overseeing the actions of a Spokane County Sheriff's deputy. So can the police ombudsman look into how well the police investigated the Sheriff's office? Local experts react to a recent Supreme Court ruling on police searches. In A Way, We are All To Blame For Killing That Moose.